Jr. Detectives in the making! Aux. OFC. D. Racosky attended Career Day at Hampton Elementary School and taught the entire 2nd grade all about fingerprinting and help them make their own prints. Members who completed a creditable year in 2018 will be invited to attend an appreciation dinner hosted by the Department/Police Chief on 4/11/2019. This ticket is "SPECIAL" from (18:00-21:00) + 1 travel hr. Today and everyday we celebrate the brave women who wear our uniform and volunteer to make Baltimore County a safer place to live, work and visit. From the intrepid women serving in the 1940's Civil Defense Rescue Service, to our present-day Patrol and Flight Officers and Commanders, women have been unceasingly vital to our organization. Today, Baltimore County Police Officers will be wearing their mourning bands on their badges in remembrance and to honor a fallen hero - Sergeant Bruce Prothero. 19 years ago today, Sgt. Prothero, a married father of five was working part time as a security guard at a jewelry store on Reisterstown Road when four armed men robbed the store. When Sgt. Prothero followed the robbers out of the store he was shot twice and died an hour later from his wounds. Eternal memory Sgt. Bruce Prothero. Today, Baltimore County Police Officers will be wearing their mourning bands on their badges in memory of a fallen hero - Sergeant Mark Parry. December 31, 2001 was supposed to be his day off, but came into work so someone else could take off. He was on patrol on Joppa Road in Towson when a drunk driver struck the unmarked police car he was riding in. The drunk driver fled the scene but was later taken into custody.Sgt. Parry was rushed to the hospital where he died from his injuries on January 21, 2002. He was married and the father of three children. Eternal Memory Sgt. Parry. Law Officers Association of Baltimore County Honors Law Enforcement Officers in their Second Annual Officer of the Year Award for 2017 and 2018 For Distinguished Service in Policing. The Board of Directors of the Law Officers Association of Baltimore County (LOA) today announced the recipients of their Annual Officer of the Year Award for Distinguished Service in Policing in 2017 and 2018, recognizing the exceptional work of 2 law enforcement officers serving Baltimore County. The LOA supports law enforcement at all levels and they honor the incredible work that is being done across Baltimore County every day. The Officer of the Year Award honors law enforcement officers for exceptional efforts in policing. These two officers through their actions have demonstrated active engagement with the community. This award highlights the work that law enforcement officers do to prevent, intervene in, and respond to calls for service and public safety issues. The two officers listed below will be formally recognized on Tuesday December 18, 2018 during their General Membership Meeting: 2017 - Auxiliary Sergeant Nicholas Shearman, Baltimore County Police Department - Auxiliary Police Unit; 2018 - Officer First Class Amy Caprio, Baltimore County Police Department - Parkville Precinct. Auxiliary Officer First Class Espinal of the Baltimore County Police Department Auxiliary Unit was honored today as a Chesapeake Gateway Chamber of Commerce Hometown Hero. The award recognizes first responders who provide exemplary service to the citizens of eastern Baltimore County. ⁣In addition to his patrol duties Officer Espinal serves as an Auxiliary Field Training Officer (FTO). He also routinely provides Spanish-English translations for patrol officers, helping to better serve our community, as well as providing testimony to secure convictions in DUI and violent crime cases requiring language translations. Congratulations Officer Espinal. Baltimore County Honors Auxiliary Sergeant Nick Shearman! Baltimore County Honors Auxiliary Sergeant Nick Shearman as a Hometown Hero! 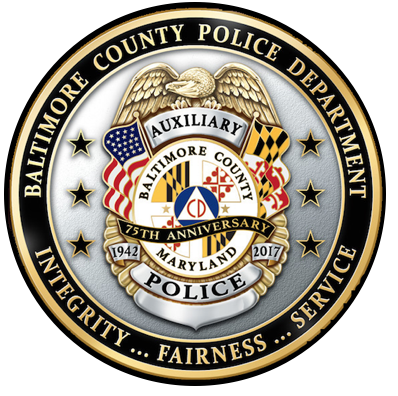 The Auxiliary Police Team is proud to announce that in commemoration of our seventy-fifth year of service, we are offering a custom anniversary badge, pin and challenge coin to our current and retired members, and a pin and challenge coin to the Baltimore County Police Department's Sworn and Civilian personnel. Orders can be placed here! Auxiliary Team Honors Officer First Class Mark Galliard! The Auxiliary Team is proud to announce and collectively extend our congratulations to Auxiliary Officer First Class Mark Galliard, who was named as the 2016 Officer of the Year by the Law Officers Association of Baltimore County. Ofc. Galliard was one of the six Auxiliary finalists for this honor. In addition to receiving an award from the LOABC, Mark also received citations from the Maryland House of Delegates, the Maryland Senate, and Maryland Governor Larry Hogan. One example of Ofc. Galliard's exceptional work performance is his willingness to 'work the desk' at the Wilkens Precinct, and interact with the citizens of Baltimore County. This directly increases both public and officer safety by allowing the Wilkens Precinct Commander to deploy an additional officer to respond to Calls for Service (911). Ofc. Galliard volunteers to take on additional responsibilities and is considered an asset to the Auxiliary Unit, his Auxiliary Detachment, and to the Wilkens Precinct. For a job well done, congratulations on receiving the 2016 Officer of the Year Award!